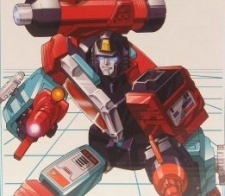 Perceptor transforms into a microscope (which also functions as a telescope). Perceptor is a scientist, one of the most brilliant minds the whole of Cybertron can offer. He is always looking to learn more, and his discoveries have proven invaluable time and time again. Though his specialties lie in metallurgy, electrical engineering, and other sciences closely related to Transformer physiology, his thirst for knowledge has made him kind of a scientific jack-of-all-trades.